I found you when I was looking up colors to go with stained wood trim. And I love that post, but here’s my deal. My h and I just went to contract on my dream home in Philly. It was built in the late 19th century. You know… charm to burn with super high ceilings, fireplaces and these amazingly gorgeous windows with really dark wood trim. Here’s the problem. I’ve been trying to plan colors and BTW, I got your new paint collection and the palettes with the boards and boy is it ever fantastic! But what I noticed is that nearly every board has painted trim. That’s fine. That’s what I want. Well… the other night, I was showing h some of my ideas. In our past home, he let me do whatever I wanted and was happy. When I told him that we had to paint the dark horrid trim, all of sudden, he was very unhappy. No wait. That is a tremendous understatement. We had one of the biggest fights we’ve ever had and believe me, we rarely argue. He’s normally a very sweet, kind man. But, he was adamant that we are not to touch the trim. It’s soooo dark and I want light and lovely– airy and not that much contrast between the trim and walls. In addition, there’s one room, where the entire thing is brown. It’s definitely a library or office. I just don’t want to live in my dream home that’s marred with the darkness of wood trim. Oh, and I’ve looked a bit at homes of our vintage and I see plenty with painted wood trim! I don’t need to have every room be white or light, but I just want my home to be bright and fresh looking. If you could write a post about this, that would be great. I’m not expecting free advice. PS: I have looked online for some ideas and everything I came up with was pretty bad. It’s the day after the election and all I can and will say on the blog is that I am very grateful that I had this post to write. And I’m grateful for all of you! Faye’s problem is one I’ve heard over and over. If you missed the above, I have written about paint colors that look great with stained wood trim. And here’s what’s funny. I too, struggled (at first) to find some photos online that weren’t already in that post! But, with time, I found some wonderful interiors with many examples of gorgeous rooms with wood trim. Before I get to them, though… An interesting question was raised in Faye’s note. Can you, should you paint stained wood trim, especially in a late 19th century historical home? As far as I’m concerned, sure, why not? It’s wood. It’s historically accurate to paint or have the wood stained. Although, in Victorian times, the stained wood was more popular. It’s a fact of genetics, (sweeping generalizations aside) men LOVE stained wood. It’s not that they don’t like painted wood. It’s my experience that once it’s painted, they like that too. But wood that’s already stained needs to stay that way. I see it as a change of color. It’s like saying that all trim needs to be white and if you paint it some other color, it’s sacrilege. Of course, you are free to disagree with me and yes, there are some situations where it’s probably better to leave the wood trim in it’s stained state. So, let’s just jump in here. Most of these photos are from homes built in the 19th century or at least look like they are. But this first one is more of a craftsman style home. I think the white looks very fresh here. But the room does get a good amount of light and the photo is a little over-exposed. That’s cheating, but what can you do? lol By the way, please check out the link above. This home is very pretty! I love the simple furnishings and black chairs which look very stylish here. Mixing in a modern pendant is just the right touch for this style. Sometimes, the mouldings and doors are a combination of painted and stained. Above and below, the wonderful work of Sheila Bridges. 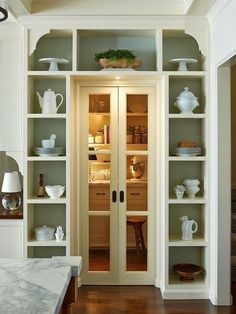 I love the combo of the painted mouldings with the stained doors and light gray walls. One of my favorite rooms ever by the immensely talented Barbara Westbrook for the Atlanta Symphony Showhouse 2014. I hope that mural is removable! From the same showhouse by John Oetgen. Fabulous windows! And another showhouse bedroom from Tish Mills. Layering and drapes softens the wood trim so that you barely notice it. Love this blue and white toile wallpaper with the stained wood trim. Originally from My Domaine, but there’s a lousy ad (grrrrr) covering up the images, so easier to see below. This photo and the next three are from an amazing home in Brooklyn, NY. How fabulous is this kitchen? It reminds me of an old-fashioned apothecary. Love how the wood trim cuts through all of the cool elements in this wonderful bathroom. I like how they chose a deep gray shade which is great for a change. Very handsome! Above and below via Garden and Gun. While this is a gorgeous home, I have to admit that here, I would prefer it if just the front door was stained and the rest painted. Another option is to paint the walls a color so that the wood trim isn’t so prominent. In this wonderful home, the wood trim is distinctly part of a dark chocolate-brown and white color scheme. If the trim is a little lighter, then the walls can be a medium tone that also helps the mouldings to blend in more. 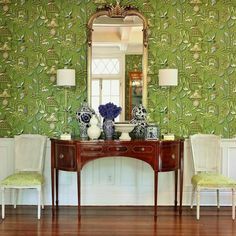 This room doesn’t have stained wood trim, but the over-scale mirrors do. I love how they expand the room and bring in a lot of light. Finishing off with a very handsome room by Scott Francis with copious amounts of espresso bean brown trim and coffered ceiling too! I think that this is a gorgeous home, but a part of me wants to see the walls in a color–perhaps a red? But I could be talked out of it. :] What do you think? PS: TIME IS RUNNING OUT! Only FOUR more days until the price increase for all products. If you own a paint collection and wish to purchase the new paint palettes (with the boards and furnishings), you were just sent the promo code again and a link to the purchase page. If you don’t see that email, please check your spam folder. The purchase page is here. You can also add-on a rolodex if you like from that page. Just put the new paint palette product in your cart and you will be given the option to add the rolodex. You can also purchase a rolodex by clicking here. 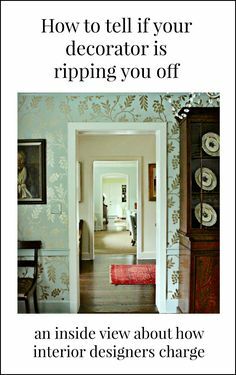 I have a Spanish style home with dark walnut doors and dark trim so this particular topic really helped me. Since it’s a Spanish style house, many recommend just painting the entire interior white. Of the BM whites, I like Linen White. It gives the walls a nice almost aged look, but I just can’t see myself painting everything white. I’m sold on painting the dining room a deep red, such as BM Caliente and so far the sample has looked really good. I so wish I could help you. I am currently receiving dozens of queries such as this one and it’s not possible for me to give an answer because I can’t see what you’re talking about. we live in the mountains where the “rustic” look is enshrined on it’s own pedestal.] If the wood walls or beams are a FINE wood, as in walnut, pecky cypress, mahogany, or some exotic or carved or finely inlaid, I recommend a pass on painting. BUT–if it is pine with 1000’s of knots, for heaven’s sake paint that goldy- orangy, mess with the stinkin’ brown dots. What are you glorifying about it? It gets WORSE as it ages. And boy do we have a boatload of it around here!In this particular area, it is 75 degrss n summer when the rest of the country is sweltering. Thus, most people come here in summer.It’s a second home, vacation, summer resort. People fall in love with the pine walls, floors & ceilings AT FIRST. 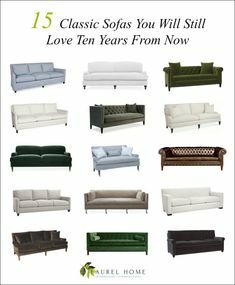 Then, they arrive in summer, and realize that ALL of their favorite linens (except for real linen or white, look lousy against the wood. Night time is even worse. The over abundance of dark surfaces render a dark, dreary evening light. Same with cloudy days. I know this gal will have to live for a time with her dark wood trim, and that SOMEDAY he may relent. Laurel, you gave some great classic examples of how it all could look, so, hopefully, she’ll work around it for now. The relationship is FAR more important than getting your way. Same with lousy tile in a bathroom, that you can’ afford to rip out—IGNORE IT. Work WITH it. Nevermind, when all else fails…..PRAY about it! Yes, for the fugly pine. We have a fair amount of it here in NY too in homes built in the 60’s. It’s usually an office or den. And it always looks so much better painted. I often paint it a warm khaki color and if the knots are really obnoxious, we fill those in a little too. Hi laurel, looked at a beautiful home today, lots of natural light and neutral colors, but the darkest wood fireplace! All I could think about was painting the fireplace, should I buy the house. Some people can’t live in dark interiors, including me – it messes up my emotional state, lol. Seriously, there is something about guys and stained wood. I think they find it masculine, and again some people don’t give themselves permission to paint wood. Different things drive our choices. For me, the home has to be an emotional investment. I do consider resale, but I look more at the years of joy I can get out of a house. I want to smile, first thing in the mornings, and know I’m in the right place. Haha! Yes, they can be rather large down here. Love your site. Please help. Live in a tiny space and I mean tiny. The living room has a wall of book shelves, light white 5 from Ikea, two small windows that face the front of building and are immediatley facing you when you enter the living room. The couch takes up the midde of the room, Pink Tufted Novogratz futon from Walmart, my budget is tinier than the room. Was thinking of painting the walls with the two windows a darker grey and the rest on the same palatte only lighter. Your home sounds gorgeous! And it’s a great rule of thumb that most rooms need both white and black elements. (kitchens and baths aside). 1. Your insights, talent, skills, and blog are most helpful and uplifting. Thank you. 2. I’ve lived in an ALL dark wood mountain home. Very large windows and natural light help–a lot. As does white most everything else. A bit of black (?!) really helps–makes the wood seem not so dark, and provide energizing contrast. Simplicity in decor is most helpful. (As all of your examples illustrate). Actually, while much was stained in the late 19th century, not everything was. Part of it might be regional. Not quite sure about that one. But, both are absolutely correct and actually, I find that painted is far more common. If for instance one searches for “brownstone interiors” on pinterest, here is what I found. I don’t like to think in absolutes about things like this. While I respect what others think and certainly if one is horrified at the thought of painting over a stained wood, then absolutely, don’t do it. But if one really does not like it and it’s also historically accurate, I see no reason not to. Actually, despite popular belief, I think that one can paint the walls dark blue with dark trim. I have some examples in the other post with dark walls and trim, but yes, there is color and/or lots of white and big windows. But I think the examples look great. I’m sure that there are some other images sprinkled through here as well. Just went through this in real life. The main living spaces were redone in 2007 using fluted oak, 6 inch base, designer Pella’s, everything stained a medium caramel. All the builder doors were replaced with solid oak, horizontal 5-panels stained the same color. Although recently repainted a silvery gray from the original light sage, these rooms are still beautiful to me. Now, the addition, windows everywhere, a darker large scale rectangular porcelain (French doors off a northern exposure and too many pets). The kitchen is glazed white. The designer had everything set up for painted trim. The Minister of Finance went through the roof. Soooo, the designer suggested we paint the trim but leave the Pella’s stained the caramel. While I was very skeptical, it turned out well. The trim speaks to the kitchen while the windows themselves recede. It works. It all sounds gorgeous! And I love your last statement because it infers something I was thinking which is it might depend what’s outside the window! Plus, there’s the trim AND the wall color, + what else is going on in the room. Are there a lot of details which keep one’s inside the space? It’s an interesting notion, but for instance, in this post where the view is everything, I kept the furnishings and colors as if they are a part of the outside, thereby bringing it all together into one integrated design element. The over-exposed photo is a conceit and I wish it would go away. I don’t like light colored walls with stained woodwork and only the very plainest woodwork in a vintage home (Queen Anne, Italianate, Stick-Style, Craftsman, etc) should be painted. I like the rich colors of paint and wallpaper of that era and re-colored and rich colors that are in favor now are beautiful, too. Believe it or not, I darkened it up a little! I don’t get that overexposed look either. But, it really was not easy finding rooms that were A) decent photos, B) nicely furnished. The reality is that stained wood trim is definitely not in vogue at this time. I think it’s a long-standing revolt from the revolting 70’s lol. Try this: place a white border behind a photo. Now try black. You will see that the black mat makes the photo pop. i’m also very happy you had this post to write Laurel:) OMG so many gorgeous rooms. Just gorgeous. I come from a land of painted trims..or do I? Lol. In short..I think these are so, so beautiful, and I think I pinned them all, I totally went bananas, sorry. Please don’t apologize for pinning everything. I want everyone to pin everything! haha. I would give ANYTHING to have a houseful of natural Victorian woodwork! I would happily commit felonies. It’s a dream my husband shares with me. I adore natural woodwork more than anything (except maybe high ceilings) and all the lovely examples shown here are why. It’s gorgeous, warm, rich-looking, sophisticated, and nothing gives a room more character. Paint is supposed to cover what’s unappealing or boring, Paint is what you use to console yourself when you DO NOT have natural woodwork, which is the gift of the gods. As long as it hasn’t been “ebonized” to blackness or pickled some sickly gray, you’re the luckiest homeowner ever . . . in my book at least.